Thanks to all of the great people who came out to the FoRIA Fall Fest on Saturday, September 22nd to talk DC Statehood with us. 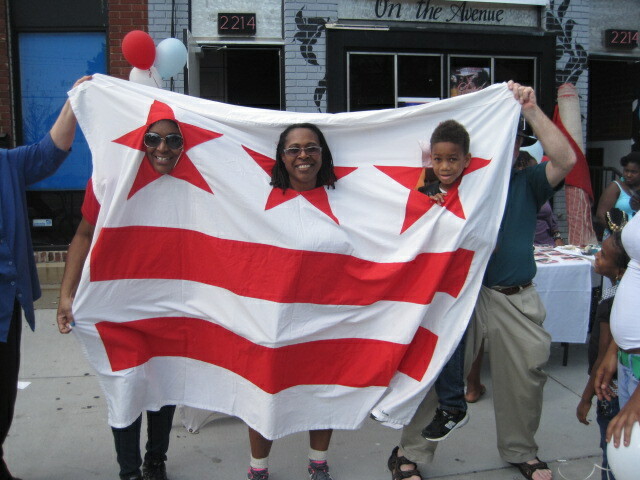 We had a great time spreading the good word about DC Statehood, answering the questions of many citizens about it, and having fun making flags with youngsters and taking pictures with the flag with people of all ages. Both FoRIA and Lace were great hosts and we truly thank them for their hospitality and interest in the Statehood movement. In order for DC Statehood to come to fruition we must all work together and its groups like the Brookland Neighborhood Civic Association, Friends of Rhode Island Ave, and community focused groups across this great city that must lead the way in educating citizens, organizing them, and inspiring them to act. On behalf of Neighbors United for DC Statehood and the BNCA DC Statehood Committee we want to express our heart-felt thanks to all involved in a great community event!